Emmy-winning Tony Awards host James Corden is back for round two. On June 9, he’ll take the stage at Radio City Music Hall to host the 73rd annual Tony Awards. Corden won an Emmy for his last turn as Tonys host, and won a Tony for Best Actor in a Play in 2012. 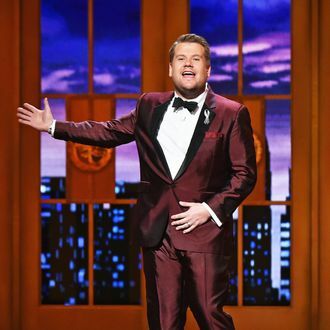 In a release, Corden said he was “thrilled to be returning to host the Tony Awards, the Broadway community is very dear to my heart and I’m beyond proud to be part of this incredibly special night.” The show will be executive produced by Ricky Kirshner and Glenn Weiss. Corden last hosted in 2016, when Hamilton was the musical heard round the world. He led the Tonys to its highest ratings in 15 years, and while he may be best known now as a late-night host, don’t forget that he actually got his start on Broadway. Corden hosting means fan-favorites John Mulaney and Rachel Bloom unfortunately did not get the gig this year. Better luck next time, guys. Check out Corden’s opening performance from 2016 below.